Using a wire wheel brush on a drill to clean cast iron pans from Wes Chitwood of Atlanta, GA.
Just a quick note about cleaning cast iron frying pans. Using a wire wheel brush on a drill or other tool will clean rust and other “nastys” of the skillet very well. I use a bronze wire wheel, but brass works just as well. You cannot damage the pan as with sand paper or sand blasting. The wire wheel will flex if you attempt to put too much pressure on it and brass or bronze is softer than the iron. Of course, the pan will need to be re-seasoned. I found some very old iron skillets in a barn at a friends farm. They were hanging on nails for who knows how long and were pretty rusty. He said they were there he bought the place and I could have them as they were no good anymore. ( I just grinned and took the “junk” off his hands.) Trial and error led me to the bronze wire wheel on my grinder. Those pans, one 18-inch, one square 12-inch, and one 10-inch looked like new ones when I finished with the wheel. Your pan is still ok. It takes repeated cooking to obtain the black color again. When you re-season your pan, you need to use high heat. Check out some of the different ways to season your pan on my cast iron web page. I have a couple questions pertaining to seasoning cast iron pans. First I was wondering if it would be a good idea to use oils with a higher smoking point than Crisco shortening? For example avocado oil has a smoking point almost 200 degrees higher than Crisco. I am not entirely sure what the advantage to using a fat with a higher smoking point would be, but I was thinking maybe if you were baking with your pan or cooking with it, it would be less likely to smoke then and add unwanted bitterness to the food. Then again, I came across another site where somebody claimed to have called Lodge and gotten a recommendation for using a 500 degree oven to season their pans. The smoke is actually said to help in the seasoning process. If this is true, could you just use a bbq outside to prevent having to vent your kitchen? Do you know what exactly the seasoning process consists of? Is it fat, or the smoke and cooked fat that helps make a pan non stick? I see no reason you could not use avocado oil when seasoning your cast iron pan. I have even used coconut oil. Let me know how your pan turns out. The seasoning process is a combination of the fat and the high heat. I have never tried using my barbecue, but since some people season their cast iron pans in a wood fire, I would think a bbq would also work. My husband sanded my old cast iron pans with 80 grit sandpaper to remove the crud and make it smooth. It worked wonderfully! It sounds like you need to sand your cast iron pan and then season it a couple of times. Y our pan will turn black with use. THANK YOU FOR THE SUGGESTION! I WILL TRY THIS. I am just hoping I haven’t ruined it! Are the pits causing food to stick? Try re-seasoning your pan a couple of times first. If that does not help, then I would suggest sanding. I remember she and my mother cooking on these kinds of pans, but I have no idea for life of me, what to do with them. The bottom/sides are caked with a carbon looking substance – even the handle has a little bit of it. I used a non-scratch utensil to scrape most of it off, but a good bit of it remains. There are what appears to be knife marks in the middle of the pan, almost as if a knife cut through the seasoning. The inside edges seem to hold a lot more oil/seasoning than the cooking surface. I have cooked in it one time (on an electric stove) and the bottom caught on fire! Of course my husband says “why would you want 50 years of baked on food to seep into your food?” – Bless his heart, he’s just a man! Your pans look just like how mine did when I first got them, Have your husband help you and do what my husband did: My husband hand sanded them until smooth and removed the burnt coating and rust. I then seasoned the pans. They are now my favorite frying pans and I wouldn’t trade or loan them to anyone! I have never tried the method of cleaning in them in the self cleaning oven. It would not hurt to give it a try. Please let me know how your pans turn out. Just remind your husband that if these were his grandmother’s pans, how would he feel. Thanks for your help. I was almost so scared I would ruin them that I didn’t want to do anything to them. I will let you know! When you purchase a “new” cast iron skittle, they are not black. They are a gray or silver color. The black comes from using your pan over and over. I would suggest that you season your pan “several” times to help get the coating back. It might take awhile, but the pan is still ok to cook in. the more you use it, the quicker it should start turning black. I found your website and it has sort of answered my questions but not quite. I recently ‘found’ one of my grandmothers old skillets, it is quite large and I have to use both hands to lift it (it’s about the size of a round BBQ grill). It is no wonder it has been packed away for at least 30 years and she has had it probably at least 30 years before that. Of course it’s severely rusted now, inside and out. My questions are what is the safest method of cleaning the layers of rust off? Would it be safe to use an air pressure sander? What grade of sandpaper? I would not use an air pressure sander, as it might do too much sanding. My husband used a hand orbital sander, because he had more control that way. He thinks he used sandpaper of 70 or 80. Your cast iron pan does not look that great! My favorite cast iron pans that I use all the time looked a lot like yours at first. My husband hand sanded them until smooth and removed the burnt coating and rust. I then seasoned the pans. Give this a try. Hello…. I just purchased some cast iron fry pans and I an having a problem seasoning them. No matter what I use to apply the solid shortening to the pan… it leaves lint with the shortening. Any suggestions? Do I have to smooth them out first? If you pans feel a little rough, how about sanding them a little? The roughness is my you are getting the lint. I always want my pans to be smooth. My husband used a his electric sander to smooth mine out. If the grease turned golden, just use some paper towels and wipe it out. If it is sticky, try washing the pan with soapy water, but do not leave the pan in the water. Repeat seasoning steps. Thanks again so much Linda… I will try a little light sanding then. It has been YEARS since I have had to deal with new cast iron pans. These are for my 27 year old son. He wanted mine but I said “No way!”. I wish you great success in your web site. It was a good feeling to know the information was out there. I will give my son your site for the maintenance of the pans. Again Thanks so much! My hint is to either wash and dry her hands and then use her hands to apply the oil or to place the liquid oil of her choice into a small spray bottle (the kind they sell for a travel sprayer in the drugstore) and just spray it on. Either of those methods will apply a nice thin layer of oil to the pan. She can have the oven door open and ready to just pop the pans into it just prior to this process, and a paper towel sitting nearby to grab after putting the pans into the oven and that way she will not get grease on the oven door handle nor will she have lint in her pan. Because my husband is the one who sand-blasted my cast iron pan for me, I asked him your question. He said: “Because the pits are on the bottom of your pan and not inside, and you have removed the rust on the pan, the pits will not hurt.” I hope this helps you and I am understanding your question correctly. Season both the inside and outside of your cleaned cast iron pan. Do it several times. I would do some more sanding to remove the layer of thin plastic. 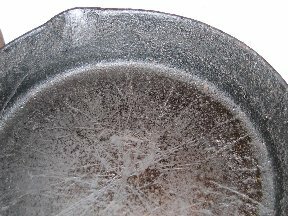 Once sanded, re-season your cast iron pan. I have two Lodge camp dutch ovens, 10″ & 12″. I bought both at the same place and time and have treated them the same. When I coat each of them with olive oil and a paper towel, the towel picks up a black residue on one and not the other. I have cooked with them often and cleaned them both repeatedly by boiling water and scrubbing them with a Lodge brush designed for cleaning cast iron. They look like they should and the food doesn’t have any off flavors, but I can’t seem to get rid of the black residue on the 12″ DO. Suggestions? It sounds like you need to sand your cast iron pan and then reseason. no need to sand!! the “black goo” is carbonization from the cooking oil when it polymerizes. Simply wipe it out. you should -never- have to sand, wire-wheel, or grind your cast iron unless you find a piece that has been sitting, and the cooking surface has started pitting. otherwise there is no need to resurface any cast iron pan! 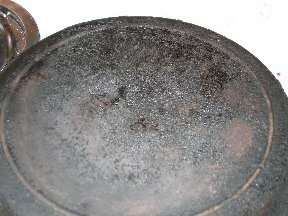 Sanding is recommended for old pans to remove rust. Hello… I have my Great Grandmother’s cast iron skillet, it is great on the inside, no rust, however, it is increasingly becoming rough on the outside. Almost as if oil has spilt over and burnt on. Although, I don’t recall that ever happening. My question is, I do not have a power sander, or drill type tool, can I sand my skillet by hand? If so, what gauge paper should I use? I am familiar with the seasoning and re-seasoning process, so I know that I will need to re-season. My husband used a his electric sander to smooth my cast iron pan out. If the grease turnes golden, just use some paper towels and wipe it out. If it is sticky, try washing the pan with soapy water, but do not leave the pan in the water. Repeat seasoning steps. We’ve resurfaced our Lodge Cast Iron griddle with wire brushes using a drill followed by sanding down to a smooth surface. Then seasoned it with Avocado oil (because of its 500 degree smoking point). The problem is that following all of this whenever I wipe the griddle with a paper towel, I repeatedly get residue coming off the griddle. So much so, I don’t want to use it for food. Any advice would be so appreciated. I always get a small amount of residue when I reheat my cast-iron griddle and lightly coat with oil before using. I just wipe it off with the oiled towel. Once the pan is hot, I have no residue coming off on my food. Basically, I am re-seasoning my pan before each time I use it. Good work! Thanks for sharing this content. I know Cast Iron Skillet Question and Answer. This content helping for others. I think next time we want more interesting content from you. I am waiting for your next content. I recently purchased an old Wagner skillet. I have cleaned off the built up residue and rust. There is some pitting and rough spots on the inside that are below the level of the surface of pan if that makes sense. Is using a wire wheel the best way to address this? I’m confused on whether you should only use sanding etc if it is for build up. Will it damage the pan further trying to sand these areas? I have two Lodge pans that belonged to my mother who passed away a few years ago. The seasoning is shoddy and uneven/flaky but they are black as night caked with 40+ years of seasoning. I really want to strip them down, sand them to remove the pits and re-season them but am terrified of ruining her pans. I would love to pay someone to do it professionally but apparently that doesn’t exist. What is the best way to remove such a thick layer of seasoning? the more hands off the better. I have a drill, what kind of sanding attachment could I buy/use? What oil is the best for creating a completely new layer of seasoning?